Delve into the rich archaeology of the Dingle Peninsula, finding prehistoric and medieval remains in one of the most beautiful places on the planet. Experience the sights, sounds, streets and monuments of James Joyce’s Dublin on foot with a Joycean expert. Spend a full day on Inis Mor, the largest of the Islands of Aran, where Christian ruins stand side by side with remarkable Pagan relics. Discover the magic, myths and modern realities of the Emerald Isle on this comprehensive journey from the dramatic coast and the spectacular Ring of Kerry to the pilgrimage sites of Glencolmcille and the cultural hotbed of Dublin. Scholars and schoolchildren, politicians and musicians offer you “cead mile failte” (a hundred thousand welcomes) and share the best of their country with you. Afternoon: Arrivals continue, with free time for those who have already arrived. Before dinner we will have an Orientation in the hotel. The Group Leader will greet everyone and lead introductions. We will review the program theme, the up-to-date Daily Schedule and any changes, discuss safety guidelines, emergency procedures, roles and responsibilities and answer any questions you may have. We have set aside some free time in the schedule for your personal independent exploration. Please note that program activities, schedules and personnel may need to change due to local circumstances. In the event of changes, we will alert you as quickly as possible. Thank you for your understanding. Breakfast: A full Irish breakfast in the hotel dining room. Choices vary but will include a variety of eggs, bacon, sausages, tomato, potatoes, cereals, fruit, toast, pastries and jams served with water, juices, tea and coffee. Morning: This morning we travel by motor coach with a local expert to explore the Ring of Kerry. The Ring of Kerry is made up of spectacular coastal and mountain scenery, enveloping the towns of Glenbeigh, Cahersiven, Waterville and Sneem. We’ll stop in Rossbeigh and enjoy a walk along the dramatic sandy beach that provides a safe haven for all kind of marine life and seabirds. It is a designated natural heritage area and a Special Area of Conservation. Lunch: A served lunch with water, tea and coffee in the charming village of Caherdaniel. Other beverages are available for purchase. Afternoon: The excursion continues around the Ring of Kerry, through the picturesque village of Sneem. The village comprises two squares, North and South, with a bridge acting as a knot between them. Evening: Free time. Your Group Leader will be happy to offer suggestions should you wish to further explore Killarney. Morning: We take a motor coach to the Dingle Peninsula, exploring the area’s rich archaeological heritage and unique culture. Once cited as “the most beautiful place on earth” by National Geographic magazine, much of the peninsula is a Gaeltacht – an area where the Irish language is widely spoken at home, in the workplace and at school. Along the way we’ll make a stop in Dingle Town, where you’ll have the opportunity for independent exploration. Lunch: On your own to enjoy what you like in the colourful fishing port of Dingle. 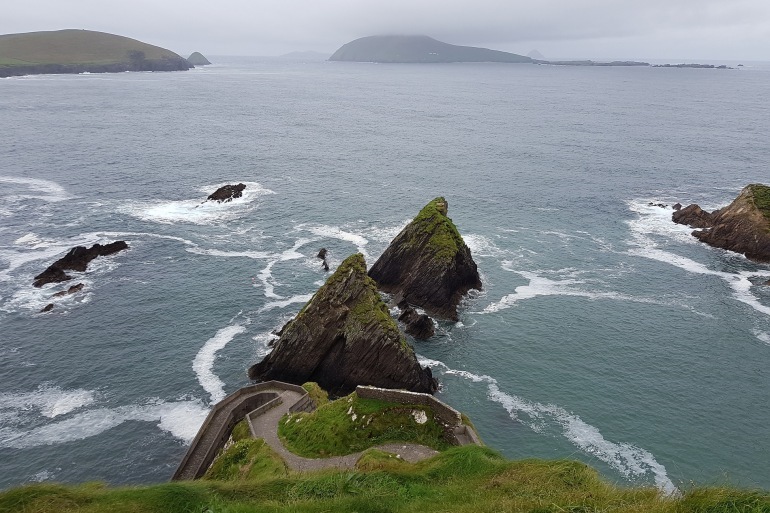 Afternoon: We’re joined by a local expert to continue our exploration of the Dingle Peninsula, whose Slea Head is the most westerly part of Ireland. Dinner: Enjoy dinner as guests of a local family in a nearby town. Learn about the rhythm of daily Irish life whilst chatting with your hosts and savouring home-cooked Irish cuisine. Morning: Take a pleasant walk to Killarney National Park, home to magnificent native Oak woods and one of the oldest Yew woods in Europe. Enjoy an expert-led gentle hike through the park, and hope to catch a glimpse of the native Irish Red Deer along the way. Afternoon: Free time to further explore Killarney. Your Group Leader will be happy to give you suggestions for activities or sights that may interest you in this charming and bustling town. Morning: We depart by motor coach for a leisurely journey to Galway. Lunch: On your own to enjoy what you like in the coastal town of Lahinch. Afternoon: We take a field trip to the world-famous Cliffs of Moher. We’ll have time to linger by the cliffs, which rise like a cathedral into the sky some 700 feet over the wild Atlantic Ocean. The views stretch as far as Galway Bay and the Aran Islands, and the location is also home to one of the major colonies of cliff-nesting seabirds in Ireland. We then continue onwards to the Burren to meet a local expert, who will lead us through one of the largest karst limestone landscapes in Europe, stopping for a gentle walk on its moon-like terrain. Morning: This morning we visit a local primary school, equivalent to an elementary school in North America. This is an opportunity to meet with the Principal and interact with local school children to answer their questions and learn about school life in Ireland. The children will also treat you to a short display of traditional Irish music, or present a project they are currently working on. Following this we will enjoy an expert-led walk around Galway. We’ll visit Galway Cathedral, the Spanish Arch and part of the original city wall before making our way down the cobbled streets to the tiny fishing enclave of the Claddagh, immortalised in the song “Galway Bay” and home of the traditional jewellery – the Claddagh Ring – a symbol of love, friendship, loyalty and commitment. Dinner: A special experience in historic Glenlo Abbey. Be welcomed by your host, a Galway academic and expert in the field of Anglo-Irish literature, before being led in to dine exclusively in the Abbey. The Abbey dates back to 1740, and was part of the ancestral home of two of the fourteen “Tribes of Galway”, the famed merchant families who dominated the economic and social life of the city at the that time. A sumptuous candlelit dinner will be served while you enjoy conversation on the topics of “The Irish Big House” and “Galway’s Literary Tradition”. Breakfast: A full Irish breakfast at the hotel. Morning: Travel by boat to spend a full day on Inis Mor, the largest of the islands of Aran. We’ll have time to explore this last remnant of authentic Gaelic civilisation, where Christian ruins stand side by side with remarkable Pagan relics, as well as having an opportunity to meet a local musician. From here you have free time to explore the island independently, on foot, bicycle, mini-van or traditional horse-drawn jaunty car. Afternoon: Continue your independent exploration. Morning: We depart by motor coach for County Donegal. Undoubtedly one of Ireland’s most untouched and ruggedly beautiful counties, County Donegal’s striking landscape has remained relatively unaffected by the passage of time. The Donegal people, too, are renowned for their warmth and hospitality. Lunch: On your own to enjoy what you like in the town of Sligo. Morning: Spend the morning with a local journalist and community worker. On foot, explore the pretty town of Killybegs, home to the largest fishing fleet in Ireland. Afternoon: Experience Glencolmcille, a unique and beautiful place that was chosen as a base by St. Columba, one of Ireland’s three patron saints. The name Glencolmcille, or “Gleann Cholm Cille”, means “The Glen of St. Columba’s Church” in the Irish language. It is not surprising that Glencolmcille is rarely on a standard Irish itinerary – you need to be determined to get there – but due to the stark beauty of its landscape it has been drawing visitors for over 1,500 years. We will also enjoy an expert-led walk to one of the 15 Pilgrimage Stones, retracing the steps of pilgrims from 500AD. Dinner: Served in a local seafood restaurant, emphasizing the local bounty of the sea. Evening: Following dinner we will return to the hotel, where you will have the opportunity to meet local musicians and dancers and learn about traditional Irish dance. Morning: We depart County Donegal by motor coach for Dublin, the bustling capital of the Republic of Ireland and your final destination. We’ll pass through County Tyrone, one of the six counties of Northern Ireland as we make our way to the Ulster American Folk Park. Lunch: Lunch will be served in a restaurant near the Ulster American Folk Park. Afternoon: The Ulster American Folk Park is an outdoor museum that tells the poignant story of emigration from Ulster to America in the 18th and 19th centuries. Volunteers in period costumes demonstrate day-to-day tasks of the era and the site consists of period housing, industry and even a full-scale sailing ship. We will then continue onwards to Dublin, a settlement since the 8th Century. Dublin is abundant with great universities, cathedrals and theatres and carries with it a unique literary legacy. Morning: We will set out on foot with a literary scholar to experience the sights, sounds, streets and monuments of James Joyce’s Dublin. Punctuated by readings, stories and bits of history, we will walk in the footsteps of Irish literary giants. Lunch: Lunch will be served during a theatre performance at one of Dublin's historic buildings. Morning: Set out on foot and experience the fascinating “Number 29” Georgian House Museum, where the widow of a prominent Dublin wine merchant originally set up home in 1794. The museum allows you to travel back in time and experience what life was like for the fortunate few who lived in such elegant townhouses, and the less fortunate who worked for them. Afternoon: Continuing our walk, we will pass the Irish Parliament and visit the National Museum of Ireland, where we will enjoy a privately guided exploration of their renowned collection of Bronze Age gold work. Morning: Experience all of the variety that Dublin has to offer during a day of free time in Ireland’s capital and most populous city. You could take a field trip to the Hill of Tara and the megalithic tomb of Newgrange, or visit Glendalough in beautiful County Wicklow. Alternatively you could relax, sip a coffee and gossip with the locals as you sample some of Dublin’s famed café culture. Afternoon: Enjoy more free time to continue your exploration of Dublin. Browse the many bookstores, explore the museums, or even try to genealogy research at the National Library of Ireland. Dinner: A served Farewell Dinner at a local eatery in Dublin city centre. Spend your last evening in Dublin enjoying traditional Irish food and relaxed banter as you bid farewell to Ireland and your new found friends. Breakfast: In the hotel. Some participants may depart prior to breakfast, whereupon a boxed breakfast will be provided. Morning: Transfer to Dublin Airport (DUB) for onward flights. This concludes our program. If you are returning home, safe travels. If you are staying on independently, have a wonderful time. If you are transferring to another Road Scholar program, detailed instructions are included in your Information Packet for that program. We hope you enjoy Road Scholar learning adventures and look forward to having you on rewarding programs in the future. Earls Court House Hotel Killarney stands on its own grounds, located 7 minutes gentle stroll to Killarney’s bustling town centre. The olde world charm and relaxed atmosphere makes it your ideal base for exploring the Ring of Kerry, Dingle Peninsula and Killarney National Park. The Mill Park Hotel is situated in the historic town of Donegal overlooking Donegal Bay. It is a 10 minute walk into Donegal Town. A native of the Burren, Shane Connolly has a diploma in archaeology from the National University of Ireland, Galway and a diploma in local and regional studies from University College Cork. He is also qualified with a certificate in agribusiness , a degree in business studies and currently runs a cattle and sheep farm in Corkscrew Hill, Ballyvaughan. An experienced educational excursion leader in the Burren, Shane enjoys good conversation and a laugh. His interests include place names, stone wall construction and folklore.